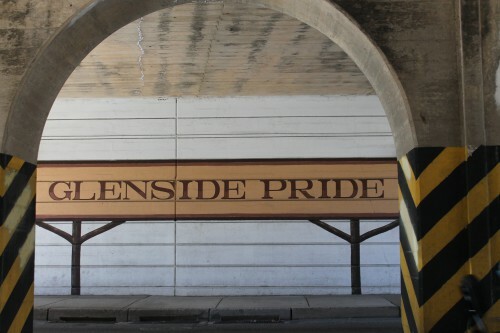 A few years ago, Steve Balin didn’t know what Glenside was and may have only heard the words “Keswick Theatre” in passing. Those were not things a lifelong Philadelphian needed to know, but now he hopes people miles around know the words and follow where they lead. Balin, along with partners Justin Turner and Steven Wennik at Franklin Residential, have spent the better part of 2015 developing a previously declining residential/retail space in Glenside’s Keswick Village into some of the area’s brightest new businesses. He compared the previous landlord’s management of the property to a car owner who hasn’t change the oil in 25 years. Of course, he wasn’t talking about Keswick Village as a whole. Franklin Residential bought the two massive, Tudor-style buildings surrounding the Keswick Theatre when the previous ownership slipped into bankruptcy. It has since been rebranded as the Keswick Commons. 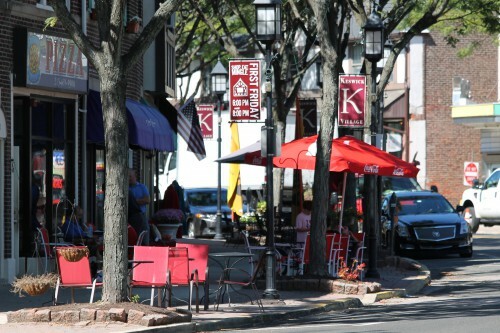 Apart from the new development, retailers in the Village, anchored by the Keswick Theatre and Keswick Tavern, have been building a reputation as a local, quaint shopping destination to outsiders for years. For residents, the draw is a little different. Places like O’Neill’s Food Market, Gerhard’s Appliances, Penny’s Flowers and William R. May Funeral Home have been cornerstones in Keswick Village as long as most have been living there. In other communities, similar businesses may have folded to make way for the corporate big-boxers. But here they are consistently growing, not just staying afloat. It’s a testament to the sense of loyalty immediately perceivable in longtime residents. Keane has owned the shop for the last 10 years, lives in the community and is president and founder of the Keswick Village Business Association. “People don’t really have to leave Glenside anymore,” she said. The idea of new development is typically challenging to longtime businesses. Originally, that was the vibe from locals when Balin and his partners showed up: Big business often changes local dynamics. But Balin didn’t want big business. He wanted to keep it local, and it had to have the right fit. 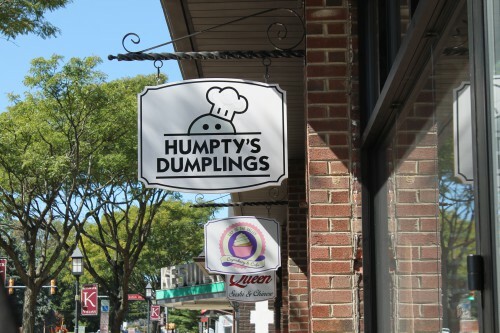 That’s what he found with Humpty’s Dumplings, the Asian-inspired dumpling shop that was opened over the summer by Glenside residents. Same goes for Weldon’s Soda Fountain, which specializes in ice cream and other treats. It was founded by Jackie Ecker, who also owns the Village Diner, and John Thompson, who owns a Taste of Philly pretzels, both located in Keswick Village. Also opening in the Keswick Commons soon is Lily of the Valley Cupcakery, which is moving from its previous location on Limekiln Pike. Dino’s Backstage, currently being built directly next to the Keswick Theatre, will round out the food options with some upscale dining and entertainment (read more on that in the “Dining Spotlight”). There is one more retail space available, and there have been offers, but Balin is looking for the right tenant. That means somebody who has a stake in the community and offers something that will augment what is already there. The space above the businesses is being converted into upscale apartments. Each one that’s finished has been rented, and there’s a long waiting list for those to come. Another thing Balin and his crew did that immediately endeared them with locals was preserving what was originally envisioned by famous Philadelphia architect Horace Trumbauer when he designed Keswick Village in 1929. The property was given a facelift to heighten that aesthetic, when they could have upended it and started over. Keswick Village is unique in that it doesn’t need a total revamp for revitalization. The bones are there: the people, the ethic, the business. What forms around those bones will decide how attractive it looks from the outside.